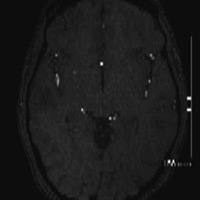 A 38-year-old woman with headaches (presumably migraines) was scheduled for an outpatient MRI/MR angiography (MRA) brain evaluation. Aside from mild acid reflux, the remainder of her past medical history and review of systems were noncontributory. Routine 3T MR brain imaging revealed scattered foci of subcortical and deep white matter T2/FLAIR hyperintensities, primarily distributed within the bifrontal white matter. Diffusion- and susceptibility-weighted imaging and gradient echo sequences were all normal. The MRA study demonstrated robust flow-related enhancement in all vascular territories; overall vessel caliber was smooth. No aneurysm or vascular malformation was identified. However, the bilateral A1 segments converged into a single trunk, and no discernible anterior communicating artery (ACoA) could be seen. A solitary A2 segment then gave rise to a single callosomarginal branch ultimately bifurcating into pericallosal arteries. Figure A is a lateral projection of right internal carotid, anterior cerebral (ACA), and middle cerebral arteries. Figure B is an axial 3D time-of-flight image demonstrating a solitary A2 segment. Figure is a whole brain maximum-intensity projection (MIP) that reveals the absence of the ACoA. • An azygous ACA is characterized by the absence of a normal ACoA and a single A2 segment distal to the A1 confluence that remains unpaired to the level of the corpus callosal genu. Overall incidence is less than 1%. Phylogenetic studies have revealed a similar configuration in lower primates, perhaps testament to our evolutionary similarities (and overlap). • An azygous ACA has nearly twice the blood flow and hemodynamic pressure compared with normally paired A2 segments, thereby increasing the risk of saccular aneurysm formation at the distal end of the A2 segment. Some authors claim the risk of aneurysm formation approaches 71%. 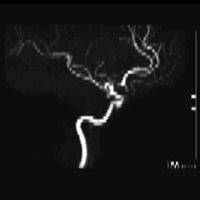 Case reports have even documented aneurysm formation at the A1 confluence mimicking an ACoA aneurysm. • The azygos artery frequently is associated with other malformations of the central nervous system, such as porencephalic cysts, agenesis of the corpus callosum, hydranencephaly, and arteriovenous malformations. • Defining intracranial arterial anatomy is critical, especially when reporting anatomic variants that may have relevance along the course of an individual’s life span. MRA remains a noninvasive examination that requires no IV contrast and delivers no ionizing radiation. Image clarity is absolutely necessary to accurately characterize the small caliber arterial vessels. Consistency and quality of MRA imaging is primarily a function of the scanner and various software packages available. This young woman’s azygous ACA was clearly captured using the AngioPlus Package on our Philips Achieva 3T MRI, which includes 2D and 3D inflow techniques, phase contrast, quantitative flow, and contrast-enhanced MRA. • After notifying the patient’s primary physician of the pertinent findings, a suitable management plan was adopted that will include serial follow-up with 3T MRA. Monitoring for development of a de novo aneurysm at the distal bifurcation of the azygous ACA is imperative. — Neha Sinha, MD, is a radiology resident at Saint Barnabas Medical Center. Huh JS, Park SK, Shin JJ, Kim TH. 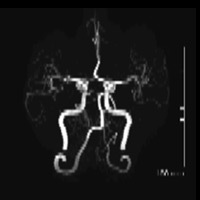 Saccular aneurysm of the azygous anterior cerebral artery: three case reports. J Korean Neurosurg Soc. 2007;42(4):342-345. Fujimoto Y, Yamanaka K, Nakajima Y, Yoshimura K, Yoshimine T. Ruptured aneurysm arising from the proximal end of an azygos anterior cerebral artery—case report. Neurol Med Chir (Tokyo). 2004;44(5):242-244.